Howdy, friends! I hope you all had a fun and safe 4th of July weekend and are settling back into the grind of reality again. We had an extra day off of work on Friday and let me just tell you, an extra day makes a world of difference. I feel like we got SO much done at our house. The extra day gave us extra time to be productive and to socialize. That’s what I’m talkin’ about y’all. Balance. Now the challenge is to keep that momentum going. We’ve lived in our house for a little over 18 months now and are finally getting things situated and set up the way we want them. My goal is to work on one room or project every weekend, and if we can stick to that, we’ll have the main projects done in just a few more weeks!! That’s exciting stuff, y’all. Fo’ real. Exciting like these here burritos. 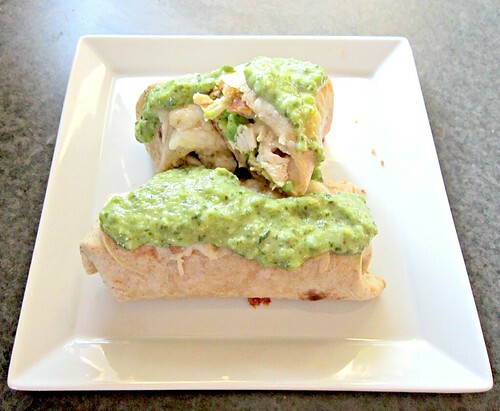 I’ve made another version of a chicken burrito with poblano cream sauce, but it was different. Delicious, but different from this one. The sauce for this burrito is out-of-this-world-amazing. And while I’ve used poblanos in plenty of recipes before, I’m starting to realize what an under-used pepper it really is. At least by moi. The filling for these is simple, but that’s ok because it lets the sauce really be the star. Because really, the burrito is just a vessel by which to eat the sauce, let’s be honest. And you will likely have sauce leftover, but it won’t go to waste. You will find something (anything, everything) to put it on. I’ve recently started throwing extras into the freezer, like immediately, if I know they won’t be eaten within a couple of days. I have some pork carnitas soup, Spanish rice, and now a leetle bowl of this sauce, too. Sure, I could’ve eaten it rightthenandthere, but I exercised some self-control and put it away. In the freezer. Where I couldn’t easily get to it and eat it on a whim. Yeah, you’re right. That was a dumb move on my part. And now I want to cry. But instead I can save you from making the same mistake. Don’t save the leftovers for later…eat them right away. Or the next day, anyway. You’ll be glad you did. Get these in yo’ bellah – stat! Turn the broiler on in your oven, line a baking sheet with foil, spray with cooking spray, and place the poblanos on top. Put under the broiler for about 5 minutes per side, or until you can see blackened “blistered” spots all over. Remove and place in a bowl or container and cover with plastic wrap or a lid. Leaving the broiler on, now place the garlic cloves on the baking sheet and drizzle with olive oil. Place in the broiler for about 2 minutes, until dark spots start to appear. Remove and place in the bowl with the poblanos and cover, for 10 minutes. Turn the broiler off and set the foil-lined baking sheet aside for later use. While the peppers and garlic are resting, season the chicken on both sides with salt, pepper and the Chile powder. Heat a large skillet over medium-high heat, add a tablespoon of olive oil, and cook the chicken for 4-5 minutes per side, or until cooked through. Cover and set aside for about 10 minutes, then slice it up into bite-sized pieces. Meanwhile, remove the skins, stems and seeds from the peppers, and the garlic skins. Place them in a food processor or blender, and add the heavy cream, cilantro and lime juice. Pulse until smooth and creamy. Season with salt and pepper, to taste. Pour sauce into a small sauce pan and simmer on low heat while you assemble and bake the burritos. Using the prepared baking sheet that you set aside earlier, make your burritos, one at a time, by placing a few spoonfuls of the chicken, diced avocado, and about 1/4 cup or so of cheese in the center. Fold the sides to the center and then roll it up into a burrito, placing it seam-side down onto the baking sheet. Repeat with the remaining tortillas and filling. Sprinkle the remaining cheese on top and bake for about 15 minutes, until the cheese is melted and bubbly. 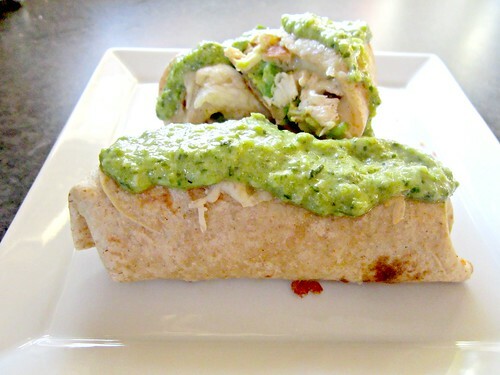 Serve the burritos with a generous helping of the poblano sauce on top and enjoy!! « What’s Baking Round-Up: Baking with Fresh Fruit!